Macaroni salad is a classic recipe for barbecues and picnics. 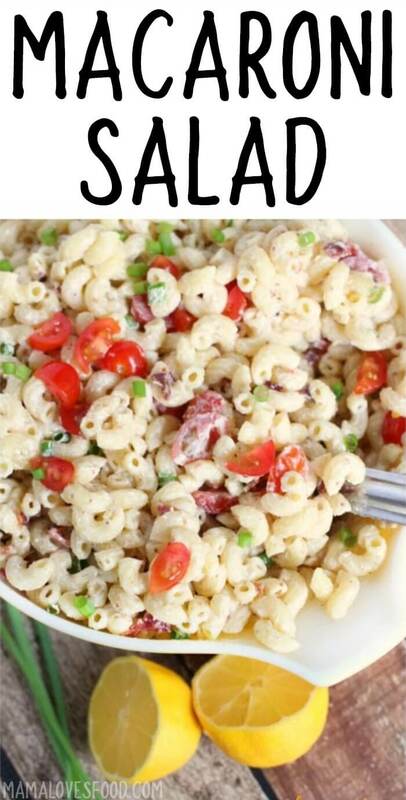 This macaroni salad recipe is by far the best ever and will be a hit wherever you bring it! 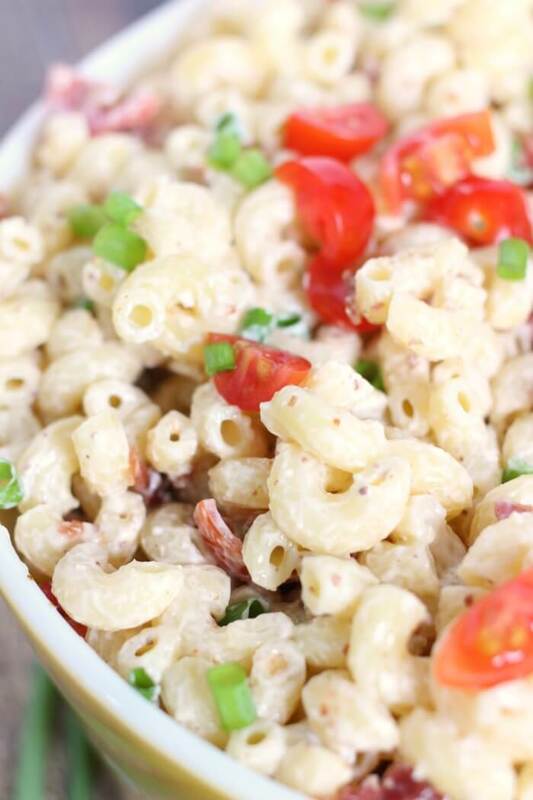 Our macaroni salad is made with mayonnaise, dijon mustard, and bacon. It’s always the first side dish to go when we take it to a potluck. I like to serve it with slow cooked pork ribs and lemon cake mix cookies or peanut butter cookies! 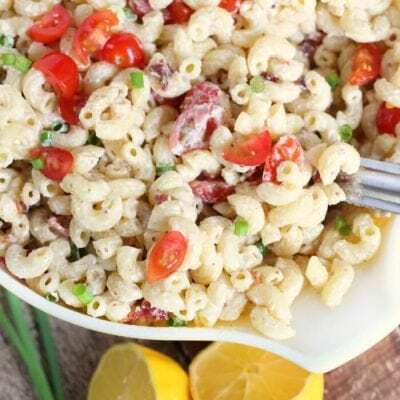 I love this macaroni salad recipe with fresh ripe cherry tomatoes and green onions, but if you have kids (like mine) who squawk at those ingredients, you can skip them! Elbow macaroni – Technically you can use any type of pasta, but traditionally macaroni salad calls for elbow macaroni. The nice thing about elbow macaroni is that it has all those nooks and crannies to hide the dressing and make every bite flavorful. Mayonnaise – Mayonnaise is the base so your macaroni salad is super creamy and delicious. Please do not substitute Miracle Whip, it is not the same! Dijon mustard – This adds a great tang and high note, also a little more creaminess. Crumbled bacon – Salty, smoked, and adds perfect texture! 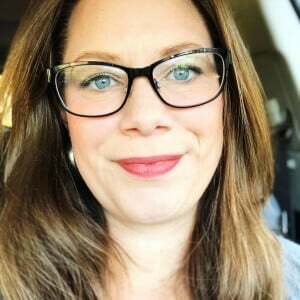 Cherry tomatoes – I love the sweetness of tomatoes for this macaroni salad, but my kids are super anti-tomato, so if I’m making it with them in mind, I’ll skip the tomatoes. But it makes me sad. Lemon juice – Brightens the whole thing up! Garlic salt – I’m almost sure that garlic salt is good on everything. Literally everything. Green onion – For a pop of color and flavor! What is good to eat with macaroni salad? 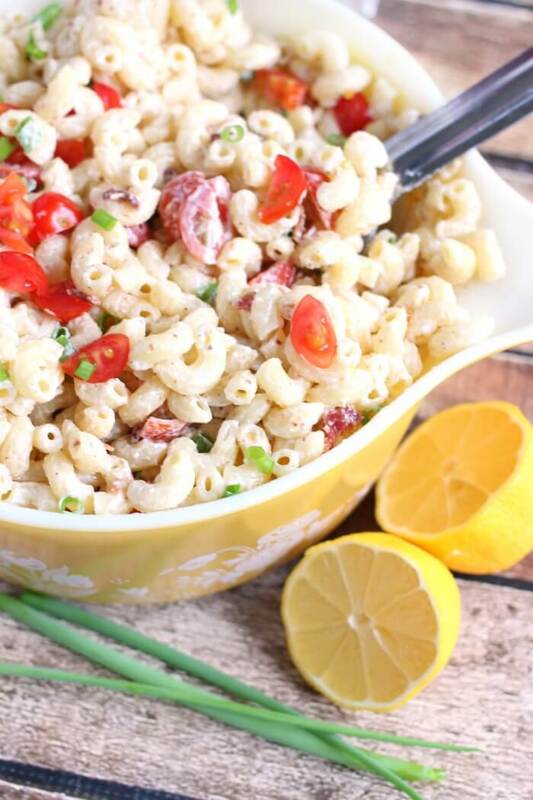 Macaroni salad is traditionally served at picnics, potlucks, and barbecues. For a picnic I like a good roast beef sandwich and peanut butter chocolate chip cookies. At a potluck the chili dog casserole is always a hit, and for barbecue definitely ribs. Apple cider ribs maybe. Mmmmm. Do not freeze macaroni salad. Freezing macaroni salad will make the pasta mushy and unappealing in texture. The nice thing about macaroni salad is that it’s easy to make and comes together quickly, so there’s really no good reason to freeze it. Chicken Pasta Puttanesca Soup – Absolutely one of my favorites. So fresh and bright. Easy Chili Mac and Cheese – Deeply comforting food. Perfect for a cool evening. Butternut Squash Mac and Cheese – Delicious and so creamy. Curried Mac and Cheese – Love this one with broccoli! Measuring cups and spoons – If you’re going to have some great stainless steel serving spoons, you definitely ought to have the matching measuring cups to go with it. You can also watch us make this Macaroni Salad on YouTube along with a Peach Upside Down Cake! Make sure to tune in for all our live cooking shows! 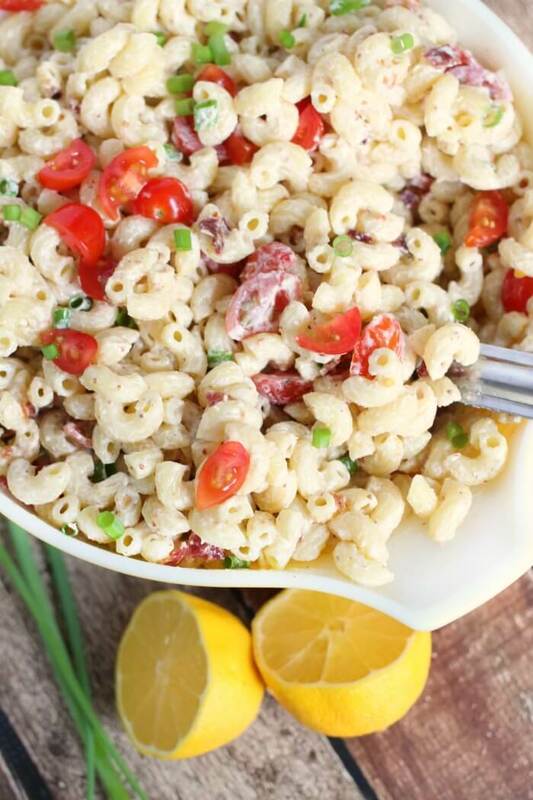 This Macaroni Salad made with mayo, lemon, dijon and bacon is the perfect pasta salad for your next barbecue! 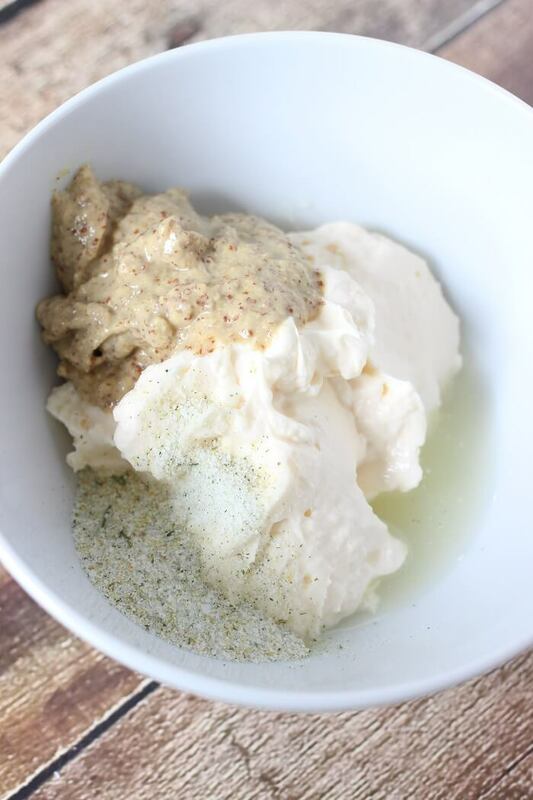 In a small bowl, mix the mayo, mustard, lemon juice, and garlic salt together. Pour over macaroni and stir until everything is coated. Add tomatoes, bacon, and green onion. Toss to incorporate. Pasta salad is just the best pot luck dish! And the bacon and mustard in this is sure to please! This will for sure be my new go-to side dish…it’s perfect! I added the ingredients to the warm pasta. It helps meld the flavor and they stick better to the noodles. Chill to cold. Be sure to salt the boiling water generously. Wow, this Macaroni salad looks so inviting! And its very easy to prepare, can i add boiled egg to it? BOILED EGG SOUNDS LIKE A GREAT ADDITION TO OUR MACARONI SALAD!